Do you want more money in your life? Pocket Guide to Riches:A Formula to Create Money On a Consistent Basis, shows you step by step how to attract money NOW! 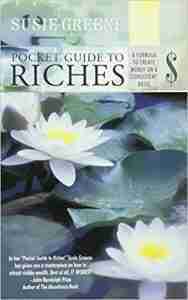 In here book, Pocket Guide to Riches: A Formula to Create Money on a Consistent Basis, Susie Greene includes a set of affirmations after each chapter along with an affirmative meditation at the end of the book. Gratitude Seeds is proud to present these affirmations and meditation. “I am happy and grateful to share the principles in this book and know that this is just the beginning of your own journey of enrichment and fulfillment. The intention of this meditation is to help you realize that nothing keeps you from your wealth, that it is not now, nor has it ever been something outside of you. In this meditation, an affirmation will be stated twice so that you hear it once in full and for you to repeat to yourself.